Because we live in Western Montana, we just had to have a two piece logging truck - like the logging trucks that pass our shop. Our Montana Logging Truck is just that - a cab with driver and a detachable trailer with a load of "real” environmentally friendly Ponderosa Pine logs. These logs came from the 35 old growth trees that were blown down in a severe windstorm this past winter. 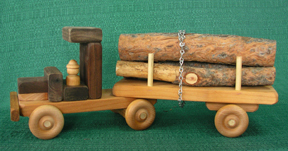 Our toy Log Truck is constructed of mixed hardwoods and has a natural oil finish. Because the logs are removable, your little logger might need some extra help. Out here in Montana, there are bulldozers to move the logs and crane trucks to load the logs on to the logging trucks. You might consider adding our Crane Truck and/or our Bulldozer Unit to your Log Truck purchase. Once the logs are processed at the mill, the lumber is then sent off to be used, generally in home building. This is where the toy Lumber Truck can be used. For smaller loads of logs or lumber, add to your collection the Large Logger Truck and the Large Lumber Truck. Our Montana Logging Truck would be a wonderful collectible for a professional logger, as well as a play toy for the older toddler. (For over 3 years old). All materials © 1999-2019 D and ME Wood Toys LLP, All Rights Reserved.